MIA ALBACHIARA kennel has been registered in Federation Cynologique Internationale (FCI) and Latvian Cynological Federation (LKF) on the 1st February 2006, recognized as LKF breeder of merit in 2013. The experience in cynology has been since 1994. 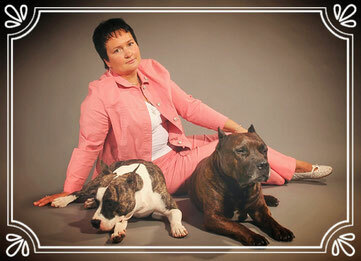 Specialization: the American Staffordshire Terrier (AmStaf). The goal we want to achieve is to get healthy and phenotypical dogs in moderate type which is the golden mean according to the American Staffordshire Terrier breed standard. Many people remember that an AmStaf should be strong and powerful, but unfortunately things like grace and temperament have been forgotten. But exactly the true temperament is a real breed’s treasure which should be cautiously passed to offspring. 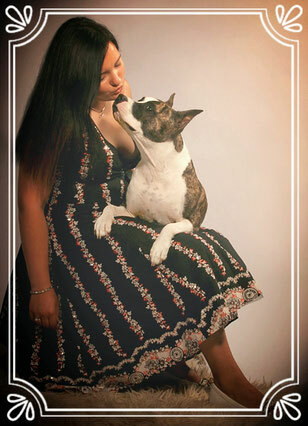 Only during a contact with an intelligent, mentally balanced but in the same time spirited dog, you can feel a real pleasure and discover what a marvelous breed American Staffordshire Terrier is. If you are interested in getting to know us, you’re free to contact us.